After capturing the ITA National Championship this fall, Seward County #1 doubles team of Ronzai Saurombe and Alejandro Gonzalez will begin the 2014 season ranked #1 in the country, leading three Seward doubles teams ranked in the top 40 and a Saints team ranked #9 in the opening 2013-2014 ITA Rankings. Ronzai Saurombe and Alejandro Gonzalez pick up the first #1 ranking in school history for Seward County after an exceptional fall which saw them post a 13-2 record together. The pair reached the tournament finals in all four events that they played together this fall, winning the Bethany Invitational, Metro State Invitational, and ITA National Tournament along the way. Their only two losses of the fall came in the ITA Regional Championship match and the ITA Nationals Super Bowl match. The freshman duo will be the heavy favorites to bring home the Region VI Championship this season at #1 doubles with the next closest Jayhawk Conference pair ranked #8 in Busby/Moore of Cowley. The Saints #2 doubles team of Trevor Kipping and Brandon Kafarela earned a #23 ranking going into the spring season. Kipping and Kafarela were 5-5 together this fall, winning the Bethany Invitational B draw consolation title with a 3-1 record. 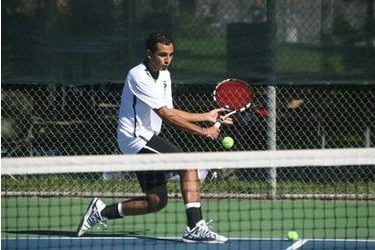 Seward also had their #3 doubles team ranked in the top 40 as Colin Glassman and Adrian Amado checked in at #36. Glassman and Amado both battled injuries this fall and were unable to pick up a win in eight chances. On the singles front, the Saints put two players in the top 50. Saurombe opens the year at #10 after a dominating fall that saw him go 15-3 in 18 matches. Saurombe won the Bethany Invitational as well as the Metro State Invitational and finished runner-up to his teammate Gonzalez in the opening tournament of the fall at the Wichita ITA’s. He is ranked 3rd among Region VI players with Spartak Rahachou of Johnson County and Harry Busby checking in just in front of him at #8 and #9. Gonzalez also broke into the top 50 in his first season in green and white. Gonzalez will start the season ranked #41 after posting a solid 13-3 mark this fall. Gonzalez opened the fall season with a bang, breezing to a Wichita ITA Tournament title, beating Saurombe in the finals, and the freshman from El Salvador also closed the season strong, winning all three matches in the Saints trip to the Tabor Tournament. As a team the Saints were ranked 9th, just behind the Cowley Tigers who were ranked #8. The Saints finished the fall with an overall match record of 72-60 and won their only dual of the fall with Southwestern. As usual, Tyler will start the season at #1 and New York’s, ASA Institute was ranked #2.